Armature Coil is one of the most experienced and trusted manufacturers and suppliers of standard electric batch ovens. We have been providing high-quality ovens since many years now, and have gained a vast number of satisfied customers. The industrial batch curing ovens that we provide are capable of drying, curing, and baking various items having a vast variety of coatings and substrates. This makes these ovens multi-purpose, and highly versatile. For larger loads, there are walk-in, and floor-mounted models of these ovens, which allow easy access. 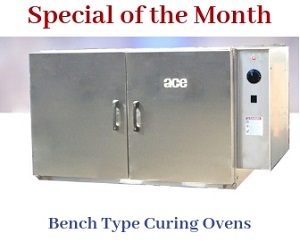 These ovens are also ideal for use in case of small loads with a bench-type model. These batch process ovens help locate electrical elements and feature an optional exhaust blower on its roof. This helps in saving a lot of floor space. The standard electric batch oven features a heavy-gauge wall and roof panels, which are made from an aluminized steel interior and a painted cold rolled steel exterior. Besides this, the wall and roof panels are 4″ thick, which make these ovens sturdy. The electric batch ovens or drying ovens are very easy to install. Besides, we provide a comprehensive assembly and testing services of these ovens from our factory. Utmost care needs to be taken, while installing the electric batch curing ovens, although they are easy to install. It is highly recommended to take help from a contractor, who has a proper qualification in the installation, as well as service of various industrial processing and finishing equipment. You must ensure that the contractor complies with all the rules, regulations, and requirements stated in the ACE manuals. The person should conform to all the necessary government authorities, such as NFPA-86 that are related to everything including installation, service, and operation of the industrial equipment. If you want to learn more about the requirements for installation, you can refer to the Installation, Service, and Operation Manual, which will guide you with all the necessary information required for setting up the batch process ovens. We highly recommend you to carry out through annual inspection by a qualified contractor. Once the inspection is done, it is always a good idea to perform all the necessary servicing. Remember, you should only use the replacement parts provided by Armature Coil Equipment Company for performing service.